Sighted for the first time on June 20, 1670, CK Vulpeculae passed through a few peaks of brightness that made it visible even to the naked eye until it disappeared at the end of May 1672. Today we can see a bipolar nebula that in recent decades has been the subject of various examinations that led to various hypotheses. The theory of the merger between two stars is today contradicted by a team of researchers that offers a stranger one, given that the conclusion is that it’s a merger of a white dwarf, the remains of a star similar to the Sun, and a brown dwarf, an object not massive enough to trigger nuclear fusion. The ALMA (Atacama Large Millimeter/submillimeter Array) radio telescope, inaugurated in March 2013, has already been used to detect aluminum-26, an unstable isotope, in CK Vulpeculae, a discovery described in an article published in the journal “Nature Astronomy” in July 2018. Now it’s been used again to study molecules and isotopes that could offer clues to its origin. The presence of lithium, normally destroyed inside stars, and abnormal isotopic ratios for carbon, nitrogen and oxygen, suggest that they came from a brown dwarf and arrived on the surface of a white dwarf. 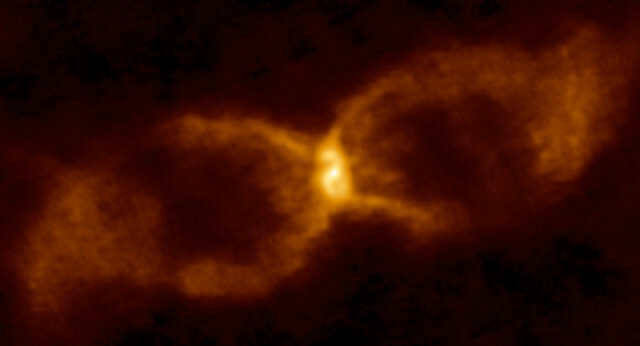 The eruption of those materials together with the thermonuclear reactions generated by the collision created the nebula with an hourglass shape visible today. In the nebula, traces of formaldehyde and formamide were also found, organic molecules that would be destroyed in an environment in which there’s a nuclear fusion reaction. The conclusion is that they were produced from the residues of the explosion, another indication of the presence of a brown dwarf that was torn to pieces by the white dwarf. According to the new reconstruction, the white dwarf had a mass about 10 times greater than the brown dwarf’s but was much smaller because it was much denser. When the brown dwarf approached the white dwarf, the increasing tidal forces it suffered torn it into pieces, spreading the molecules that were then scattered in the nebula. It’s the first time that evidence of an anomalous nova of this type is found but that doesn’t mean it’s rare as binary or even multiple systems are common. More and more perfected instruments such as ALMA allow to investigate these events much better so in the future we’ll know much more about them. An interesting possibility is that the molecules from nebulae of that type, including the organic ones, get scattered in interstellar space and could end up in a star system in its formation phase. In some cases, even life building blocks could be present in a star system from the beginning.